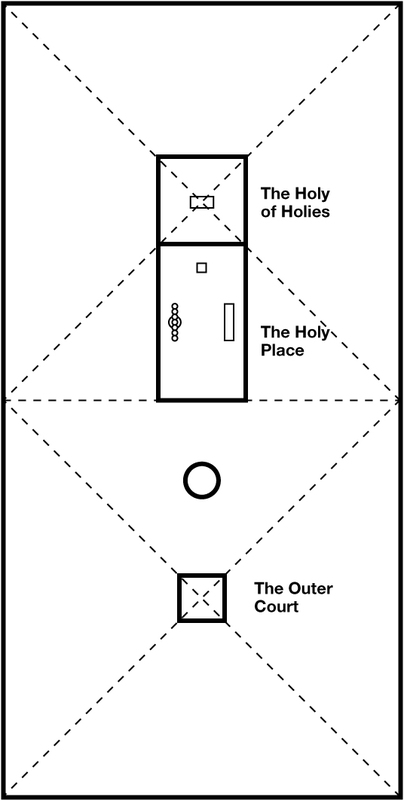 The temples of the Old Testament were made up of three areas: the outer court, the Holy Place and the Holy of Holies. Presidencies in the church are made up of threes. Brigham Young when revealing the design for the Salt Lake Temple placed three towers on the Eastern end to represent the Melchizedek priesthood and three pillars on the Western end to represent the Aaronic priesthood. We have three branches of government that were created to keep each other in check to ensure balance and harmony. Man, woman and God together create a harmonious marriage. Jesus was buried in the tomb for three days and three nights, just as Jonah was in the belly of the whale for three days and nights as well. The oxen under the ‘sea of brass’ in Moses’ tabernacle and under the baptismal fonts of modern temples are grouped in threes, three facing North, three South, three East and three West. We also know of the three degrees of glory; the Celestial, Terrestrial and Telestial kingdoms. Christ was tempted in three different ways by Satan while he was fasting in the wilderness. Three relics were contained in the ark of the covenant: the budded rod of Aaron, the remnants of the ten commandments and a sample of manna. Peter denied Jesus Christ three times and then was told three times by Christ after his resurrection: “feed my sheep”. There’s no possible way that I could include all the examples here in this post alone! Our eyes can see because of special receptors called rods and cones that are at the back of our eyes. The rod help us to see in low light conditions which is why we do not perceive color very well at all when it is dark. Cones allow us to see in color and there are three kinds of cones, each being sensitive to red, green and blue respectively. The combination of all these colors of the visible spectrum gives us ‘white’ while the absence of these colors collectively gives us ‘black’ which is the absence of light. While our eyes of flesh is can sense only the wavelengths between blue and red, the actual light spectrum spreads infinitely in either direction, giving us ultraviolet, infared, x-rays, gamma rays, radio waves, etc. With these red, green and blue in eight combinations you have: white, red, green, blue, yellow, magenta, cyan and black (absence of color) a total of 16,777,216 colors are possible on a 24 bit color system. 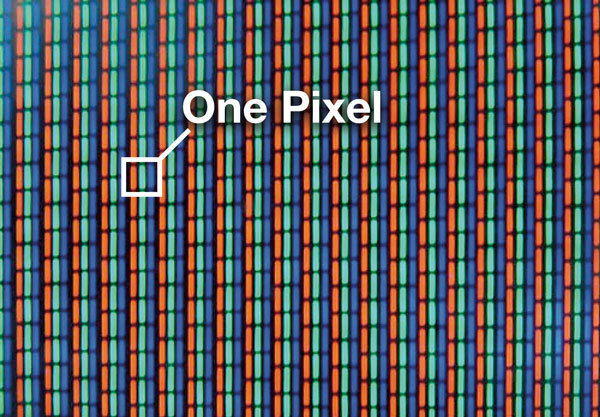 Anything higher for human viewing is pretty much overkill because the human eye can only discern about 10,000,000 colors. So many of the colors your monitor can generate, you might technically not be able to discern! Now that my personal interests in how the number three applies to the more nerdly matters of technology have been satisfied, we can move on to its application in more sacred circles. The number three appears in covenants along with other numbers as well. The baptismal prayer is done in the name of the Father, and of the Son and of the Holy Ghost. The person doing the baptizing raises his arm to the square. 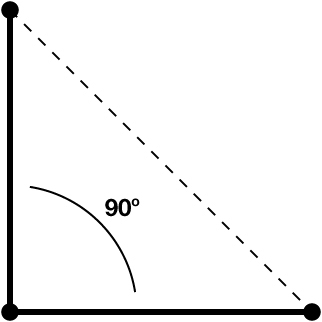 The square is first defined by three points creating a 90 degree angle. There are three earthly witnesses: the person performing the baptism and two additional witnesses. There are three elements involved: the water, the blood (of Jesus Christ) and the Holy Spirit, which although done through confirmation is final step of the baptismal process. The person being baptized is taken into the water at a 90 degree angle as well, symbolic of death, burial and resurrection. A compass is also composed of three points. The name of ‘compass’ is also given to the Liahona of the Book of Mormon which guided Lehi and his family across the wilderness to the promised land. Since the Liahona has been compared to the Spirit of the Lord, the compass and even the triad may also be connected to the Spirit. When a person is being confirmed a member of the church and hands are laid upon their head, the arms of the person performing the confirmation converge onto the head of the person being confirmed in a kind of V or compass shape. The similarity could possibly be just a coincidence, but I think it is interesting when the purpose of confirmation is to confer the Gift of the Holy Ghost. There are three elements that make up the sacramental ordinance: the bread, the water and the Spirit of the Lord. The makeup of our own being is also composed of three elements: Intelligence, a spirit body and a physical body which will become one through the resurrection, never to be divided. Pay attention to how the number three occurs in the initiatory and endowment ordinances of the holy Temple. The interesting thing about three is most often how it is combined with other numbers, particularly four. 3+4=7 three being symbolic of the divine and four being symbolic of the earthly, so when three and four meet you get 7 or perfection. When three is done in a multiple of four, 3×4=12 which is a number relating to the priesthood and divine government. Pay attention in the temple where you have three meeting with four. Another example is three plus two, 3+2=5 five is a number connected to life, even eternal life. Three in this case can represent the divine Godhead with two standing for man and woman. The union of marriage in the sight of God is for the purpose of the creation of life and perpetuating the race of man who are also the descendants of God. There are many more mathematical conjunctions that will be discussed in future articles. 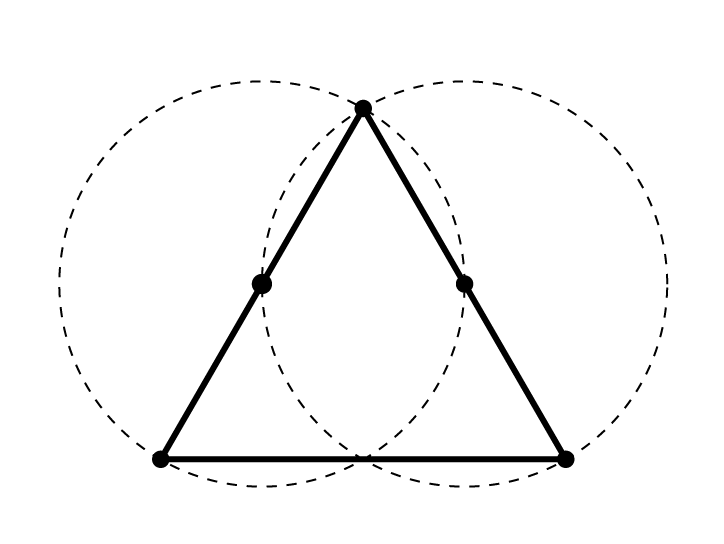 The principle of the Triad is summed up in a simple hanging balance: two opposites are reconciled by the presence of an independent third aspect above them both. 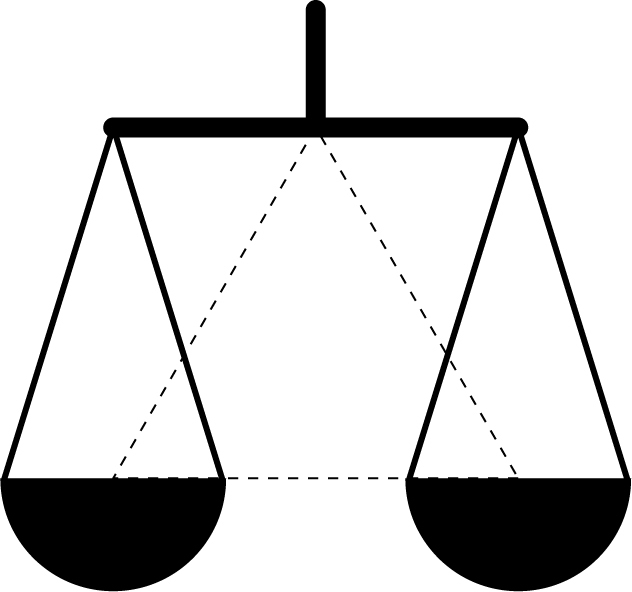 This is why scales symbolize justice by trial (Beginner’s Guide, 52). The Nephite interpreters possessed by Joseph Smith were in the shape of “two, smooth three-cornered diamonds set in glass”. For deeper research into the topic of three and how it relates to the urim and thummim and the all-seeing eye symbol, see this article here on oneClimbs.com: The “All-Seeing-Eye” Symbol and the Urim and Thummim Connection. It’s interesting to note that many sacred structures feature a Triad shape, from pyramids to LDS temples as well. The triangular shape hearkens to the divine unity as well as a mountain which is a place where God has often communed with man; temples are also referred to as the ‘mountains of the Lord’. It seems clear that God works in threes and when we see the number three, we are perceiving something divinely harmonious and complete. With the number three we can also see a reflection of our own selves, our past, present and future state that will be brought back to one in a future glory to come.